As I sit writing at my computer, with two fans oscillating the warm air of my top floor apartment around me, I can’t help to think how lucky we are to have access to reliable (and relatively inexpensive) electricity. Which reminded me of a photo I discovered online in the catalogue of the Vancouver Archives – this month’s vintage photo of the month. Power lines and supporting structure in lane west of Main Street at Pender Street. March 10, 1914. Photo: British Columbia Electric Railway Company, CoV Archives, AM54-S4-: LGN 1241. How crazy is that photograph? And we think there are too many overhead wires today! I can’t even imagine how hard it would be to service those power lines. 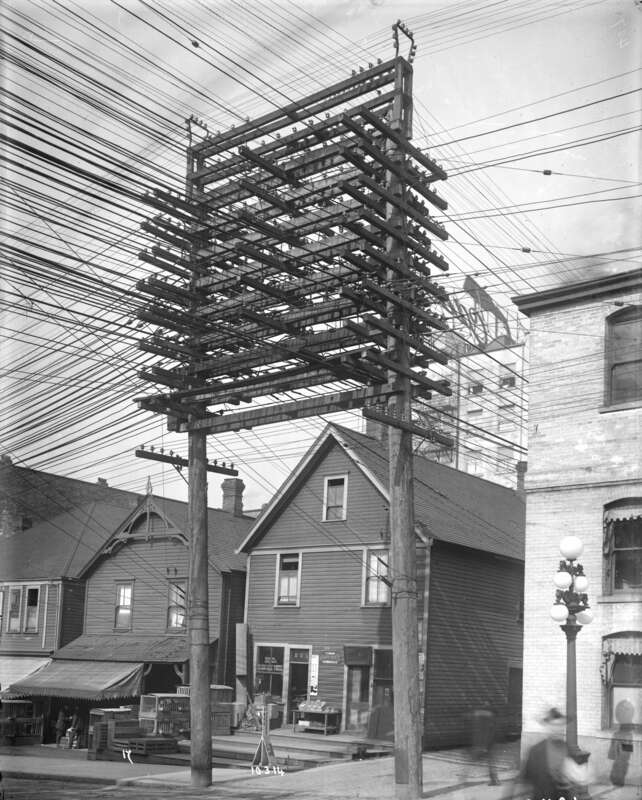 It made me wonder when did electricity first come to the city of Vancouver?